Fisherman’s Wharf San Francisco is one of the most visited places in the Bay Area. This once lively fishing hub is now a waterfront tourist attraction that offers shopping, dining, and a variety of street entertainment. With fishing boats and sun-bathing sea lions, Fisherman’s Wharf is a popular place to savor fresh seafood and chowder bread bowls. 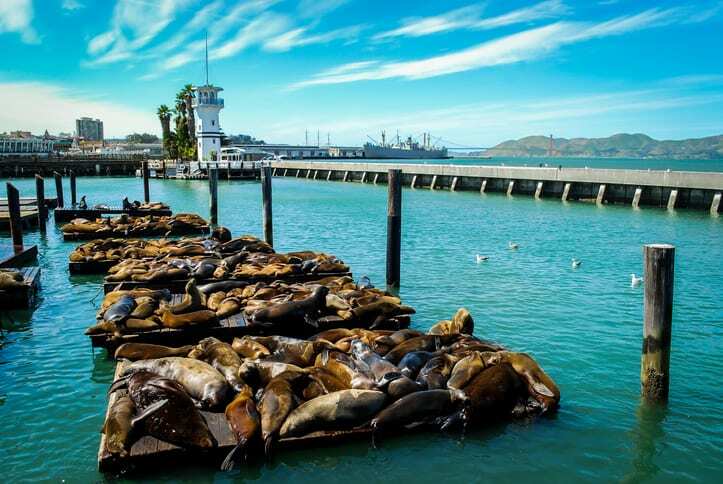 Pier 39 – With two levels of dining and shopping, the beautiful views and the famous barking sea lions are what draw in tourists from all over the world to Pier 39. Aquarium of the Bay – Encounter a staggering wall of jelly fish, a chance to view marine life up-close-and-personal and walk through a 300-foot crystal clear tunnel holding 700,000 gallons of clean bay water and local marine life. Sightseeing boats and charters to Alcatraz and Angel Island State Park are picked up here. One of the best ways to visit is to either take the historic F-Line streetcar or one of the two cable car lines that end at Fisherman’s Wharf. Insider tip: we prefer the Powell-Hyde Cable Car over the Powell-Mason line for its scenic beauty.